Once an LS3/5a License had been obtained from the BBC, Stirling Broadcast commissioned the manufacture of new T27 and B110 drive units from KEF and reintroduced the LS3/5a to the market, to enthusiastic reception. 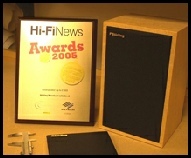 Shortly afterwards Stirling Broadcast began its path of innovation in the LS3/5a world by introducing higher quality crossovers, referred to as 'SuperSpec', and thin-walled, screw-back cabinets modelled after the prototype LS3/5a cabinets and as seen on the 001/002 pair demonstrated at the HiFi News shows of 2001 and 2002. Following problems and uncertainties with the continuing supply of T27 and B110 drive units Stirling Broadcast have introduced an updated version of the LS3/5a, now known as the V2. The designer, a luminary in the audio industry, has utilised specially prepared SEAS and ScanSpeak drive units with high grade crossovers that accurately mimic the response characteristics of the original versions. This 'V2' version retained the LS3/5a License from the British Broadcasting Corporation and is suitable as a drop in replacement for any working pair of LS3/5as. 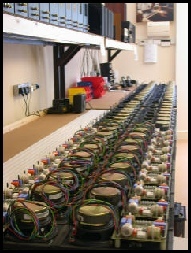 Several professional broadcast establishments have already deployed pairs of LS3/5a V2's into production environments. In 2011 Stirling Broadcast introduced an improved version of the original Rogers AB-1 subwoofer - the AB-2, and also introduced a range of LS3/5a replacement parts and kits. In late 2011 Stirling Broadcast expanded its product range to include a reproduction of the BBC LS3/6 Grade 1 monitor design, using custom versions of modern loudspeaker drive units together with a very high grade crossover. Described by Doug Stirling as a "masterpiece", this loudspeaker follows the typical BBC thin-walled design ideal and meets the requirements for high quality studio monitoring at moderate sound levels. In late 2013 Stirling Broadcast added another loudspeaker to the 'family', this time with a loudspeaker targetted at the domestic market - the SB-88. This speaker continues Stirling Broadcast's close association with designer Derek Hughes and delivers a flavour of their LS3/6 in a smaller package. Check out the Reviews page for a preliminary look at the SB-88 and a collection of reviews on the Stirling Broadcast LS3/6 and LS3/5a V2, including the Ken Kessler review of the V2 in the September 2005 edition of HiFi News.